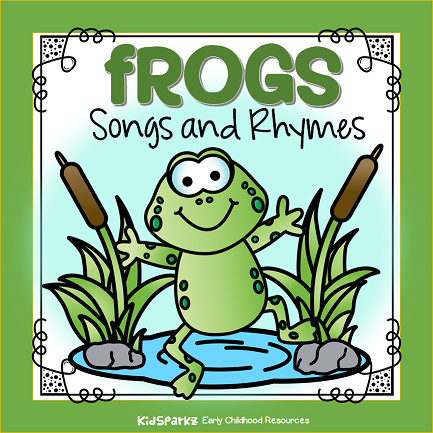 Frogs songs and rhymes for your preschool, prek and Kindergarten teaching and learning plans. “Glub glub" went the little green frog one day. "Glub glub" went the little green frog. "Glub glub" went the little green frog one day. And his tongue went "slurp slurp slurp!" They don't go slurp slurp slurp! Eating the most delicious bug. And now I'm a frog. Group action song sung to "I'm a Little Teapot"
See the little frogs swimming in the pool? The water’s great - it’s nice and cool. Trying to catch flies, they are getting sad. Back in the water they’ll go - KERPLOP! One peeked in and down he fell! Frogs jumped everywhere, to and fro. Tadpoles are baby frogs - they can swim like fish. Tadpoles grow four legs - now they can hop, hop, HOP! The froggie jumps - KERPLOP! (Rhyme) What does a frog say when it sings a song? Does it say moo moo all night long? Does it say baa baa, or does it say neigh? Does it say cheep, cheep, while hopping away? 1,2,3,4,5, once I caught a frog alive! 6, 7 8, 9 10, then I let it go again. Because it kissed me on the nose. Lost his tail, lost his tail.